For information regarding bookings and facilities of the beautiful surrounds of the Bulga Estates vineyard, please don't hesitate to contact us. For an unforgettable experience no matter the occassion, Bulga Estates authentic and historically significant setting will provide a night to remember. 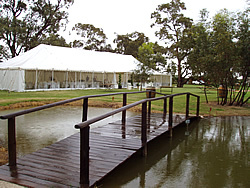 From Opera to Weddings to Your Perfect Day, a function at Bulga Estates will naturally impress.